If quality and value for money are your main concerns when shopping for new skirting board, there is no doubt that buying it online is your best choice. 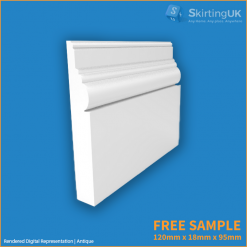 However, we appreciate that it can be difficult to choose the right skirting board profile for your home when you cannot see the products you are comparing up close and personal, which is why we offer to deliver free MDF skirting board samples to any customers who are not sure which style to install in their property. If you would like to be able to choose a new profile in the comfort of your own home, simply pick the styles in which you are interested and add a free sample of each one to your virtual shopping basket. When you come to check out, you will not be charged for any of the samples you order; all you will have to pay is a nominal postage fee.